No, not Annual Percentage Rate for all you creditworthy folks. We’re talking about the Academic Progress Report (APR) for men’s basketball (who is regularly the lowest rated sport in D1). Today the NCAA released the numbers that track athletes’ success (2003-07) in the classroom through retention, eligibility and graduation, and it appears that things are going to get a little dicey for some name-brand programs over the next twelve months. The APR has two classes of penalty – immediate and historic. Immediate penalties are levied when a program is below the cutoff score of 925 (approximating a 60% graduation rate), and one of their players withdraws from the institution, does not return the following fall term and would not have otherwise been eligible to compete during the regular academic term following his departure. 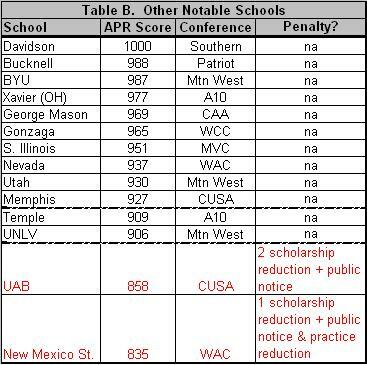 This year, Kansas St., Purdue, Seton Hall, South Carolina, Tennessee and USC were the BCS programs subject to a one-scholarship loss due to this penalty (see Table A below). K-State, Purdue, UT and USC are particularly on notice, as each of these programs could lose as many as two scholarships next year should their APRs not improve. Historic penalties are levied upon programs that have trouble consistently reaching a threshold of 900 on the APR metric. The sanctions associated with these penalties are far more severe, and can ultimately result in reduced practice time, banishment from postseason play and restricted membership in Division 1 athletics. This year among the BCS programs, only Colorado and USC were placed on public notice that their historical profile is lagging. Should their poor APR scores (<900) continue another year, then the Buffs and Trojans could face a scholarship and/or practice time reduction in the 2009-10 season. As an example of what not to do, the basketball programs at New Mexico St., Centenary and East Carolina are already one year away from facing a postseason ban based on three consecutive years of failing scores on the APR. While Colorado doesn’t seem to care much about hoops, USC, with its high-profile coach and the sparking new Galen Center, certainly wants to avoid this fate if it can (note: OJ Mayo and Davon Jefferson’s early exits will not help the Trojans’ APR in 2008-09). Table B below shows some of the other notable non-BCS basketball programs and how they fared on this year’s APR. Memphis, who is already on the cusp of the threshold, could end up getting slammed by this season’s exodus. We also thought it might be somewhat informative to see how the BCS conferences do individually. See Table C below. The ACC is clearly doing the best of the big six conferences, with only Clemson and Maryland under the 925 cutoff (neither are below the 900 threshold). The SEC, while managing to avoid last place, has seven teams under the 925 mark this year (58.3% of its teams). The Big East has five, but that only represents 31.3% of its members. As far as we can tell, there isn’t much of a correlation with our 2007 Athlademic Ratings from last summer. The NCAA appears to be holding fast on its promise to hold schools accountable for keeping its athletes eligible. AAZone’s Josh Centor, for one, thinks that the APR is working. For the skeptics who believe the penalties are soft, look at the 26 teams that have entered the historical phase of the structure this year. 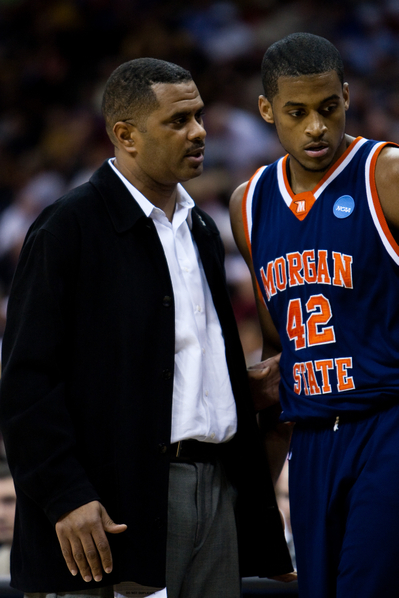 Those programs have failed to change their behavior and will face restricted scholarships, recruiting and practice time. If the academic performance of those teams doesn’t get better, the penalties will become more severe. Next year, postseason bans will be in the mix and along with the scholarship reductions, those penalties are as strong as the ones doled out for major infractions cases. It’s going to be interesting to see how these programs that are already on the cusp of sanctions respond to these challenges. Update: Seth Emerson reports that critics of the APR system are wondering if there’s any teeth to it at all, citing the fact that 69.3% of institutions that were eligible to be penalized were given waivers this year. Our favorite exception – let’s call it the South Carolina St. Rule – allows a waiver if a team’s APR is above that of the general student body. Yeah, we’d agree that if a team is outperforming the rest of the students, then either the whole school needs to be shuttered; or, the APR is rendered rather meaningless.